All-rounder Alex Hughes has signed a new two-year contract that will see him remain at Derbyshire until the end of the 2018 season. The Cricket Derbyshire Academy graduate scored 436 runs and claimed 10 wickets across all competitions in 2016. 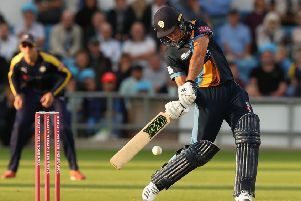 In five Specsavers County Championship matches, he hit 299 runs at an average of 34, including a career-best 140 against Gloucestershire at The 3aaa County Ground in September. The 24-year-old captained the side in nine limited-overs fixtures this summer, leading the Falcons to four victories. In total, Hughes has scored 1,907 runs and claimed 70 wickets across all formats since making his debut in 2011. Director of Cricket, Kim Barnett said: “Alex is an exciting cricketer who provides us with options with both bat and ball. “When given the opportunity, he has risen to the challenge and shown what he can do, performing very well, whilst also displaying exceptional leadership skills.